Fortunately things picked up right away. 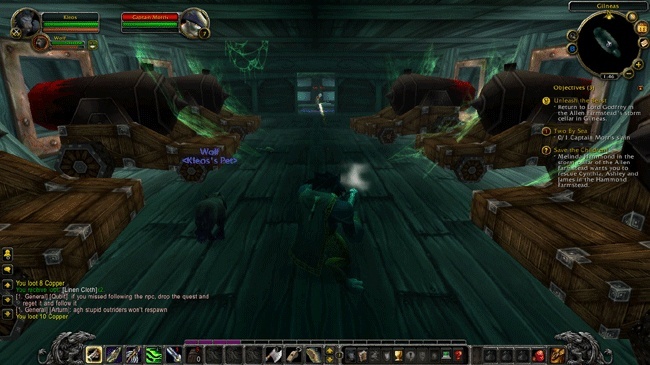 There are a couple of horseback missions to get things going and, before you know it, you'll be riding through town trying to get as many Worgen as possible to chase you to a cathedral where you can shoot them with cannons. Now we're talking! This sequence breaks out of the same old formula and gives the player a chance to really let loose. 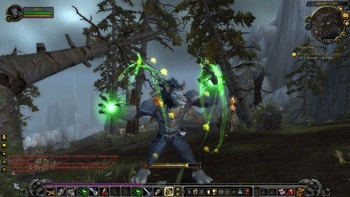 In fact, it was so fun, that I didn't even notice that I had been bit by one of these Worgen. I'd have worried about it but the Worgen stormed the cathedral and the townsfolk and I were too busy fighting to worry about that worrying little injury icon up there near the mini-map. At this point, things get kind of fuzzy. We must have won the fight because I'm still alive. But something must have gone wrong, because I'm locked in the stocks. And whatever went wrong must have gone really wrong, because I appear to be a Worgen. A kindly fellow gives me a drink and he and the crowd stand back to watch. The potion, which I'm told doesn't always work, has allowed my human side to maintain control of my new beastly form. It's a good thing too, because the Worgen attack wasn't the only problem facing Gilneas. The Forsaken has landed ships on the beach and are now assaulting the town. I decide to try out my new Worgen form by heading out to the shore and taking down all the Forsaken I can find. But the fighters are just the extremities; to truly turn the invasion, I have to take out the two captains on board the invasion ships. Since I can't reach them from the shore, I take out the Forsaken manning a catapult and use it to launch myself onto the ships. The captains weren't at all prepared to handle a flying werewolf but, honestly, can you blame them? Feeling pretty proud of myself, I head back to town to collect my reward but while I'm inside enjoying the approbation of my "fellow" men and striking a blow for Worgen rights, all hell breaks loose. The ground shakes all around, almost as if there's been some sort of, I don't know, cataclysm or something. When I go outside to check, everything is gone. Where there used to be land, now there's just a sea full of drowning watchmen and sunken homes. After plucking the few survivors from the water, I head out to find the king and queen and see what's become of the land around Gilneas. The Cataclysm has finally come to Azeroth. It looks like it's going to be a good one.